View PDF of entire document. View PDF of executive summary. Help municipal officials establish policy level direction for their communities. Identify commonly accepted design standards to provide continuity in development. Provide technical information on matters which can be incorporated into ordinances or can be used for traffic related studies. Help planners, engineers or developers in preparing site plans that recognize and accommodate this integration. Help municipal officials and the Pennsylvania Department of Transportation (PennDOT) on matters concerning the review of the circulation aspects of land developments. Provide a resource to CCPC in the review of subdivision and land development applications. The research effort which led to the publication of the original Circulation Handbook published in 1994 (for which this document is an update) consisted of a compilation of information from approximately 100 resources and from interviews with representatives from PennDOT, Southeastern Pennsylvania Transit Authority (SEPTA), New Jersey Department of Transportation, the Delaware Valley Regional Planning Commission (DVRPC), Chester County offices, municipal officials and emergency service providers. While a considerable amount of qualitative and quantitative information is provided in this handbook, it is not practical or feasible to provide all relevant material on land use and circulation in one source. Throughout the handbook the user is referred to primary resources for additional information. This handbook attempts to quantify and illustrate the range and diversity of information on the subject of circulation as it relates to land development. Throughout the handbook, the Chester County Planning Commission provides recommendations on policy and technical matters. These recommendations are intended to reflect applications which the County Planning Commission believes are appropriate for the communities of Chester County. Municipal officials should review the information provided, evaluate the range of standards and criteria, consider the various recommendations and decide on applications appropriate to the local condition. The users of the handbook are urged to consider all of the perspectives identified. Chapter 2: Principles presents policy level, qualitative information that establishes the framework for land development and circulation improvements. The planning principles are grouped into four categories: traffic circulation and safety; parking; land use; and, preservation of the environment. The planning principles are further defined by individual design concepts. Most design concepts are followed by hyperlinks to related design elements which are described in Chapter 3. Chapter 3: Design Elements provides quantitative guidance by describing and detailing the individual design elements to be considered in the design stage of any development which impacts the circulation system. A simple format is followed for each design element. Following the name of the element, a definition is provided along with the applicable standards, comments and specific recommendations from the Chester County Planning Commission on which standards to use or how criteria should be applied. Hyperlinks to the original and other outside reference sources from which the recommendation was derived accompany most of the design elements. Chapter 4: Bringing It All Together depicts a number of typical development scenarios where many of the design elements described in Chapter 3 may be applied in the same context. This chapter illustrates how the application of multiple design elements can significantly improve the function and aesthetics of any proposed development towards long term sustainability. A Land Development Review Checklist provides a quick reference regarding the applicability of certain design elements based on the location and/or size of the proposed development. 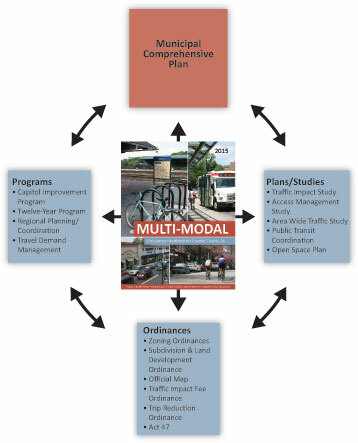 Chapter 5: Resources includes Tools for Circulation Planning which provides brief summaries of how various planning programs, plans, studies and ordinances can be applied in a comprehensive manner to improve the integration of land use and transportation. 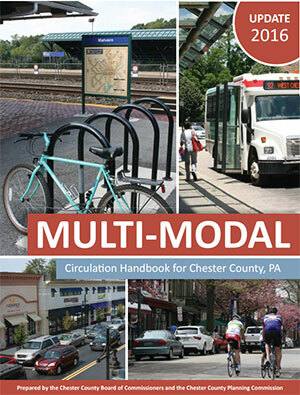 All outside publications and resources that were used to compile this Multimodal Handbook are included in a bibliography at the end of Chapter 5. The over-riding objective of this handbook is to provide a tool which can be used to create a balance between accommodating transportation needs in the County and protecting and preserving the environment.